If you have ever experienced deer visitors to your garden, you know the extensive damage they can cause. To prevent deer from wreaking havoc on your prized plants, consider planting barberry, known for its resistance against deer feeding. Realize, however, that with the benefits of this plant comes a drawback. Barberry has great potential for your garden, particularly if visited by hungry deer. However, planting barberry will only grant you a successful gardening experience if it is well-suited to the particular culture of your landscape. Barberries thrive in locations that offer full sun to partial shade; this plant is tolerant to nearly any soil type and handles dry conditions. Grow barberry in USDA hardiness zones 4 to 9, but pay attention to the cultivar and its specific requirements. Additionally, barberry shrubs fall ill to anthracnose and powdery mildew, both fungal diseases that thrive in wet conditions. Barberries (Berberis species) are shrubs with a dense growth habit that reach approximately 8 feet in height, making this plant useful as a hedge that offers differentiation from one gardening space to the next as well as privacy. Along with the dense foliage, barberry shrubs are made up of thorn-covered branches that deter deer, according to the Virginia Cooperative Extension. The Rutgers New Jersey Agricultural Experiment Station lists a wide variety of plants with letter grades attributed to their degree of deer resistance. 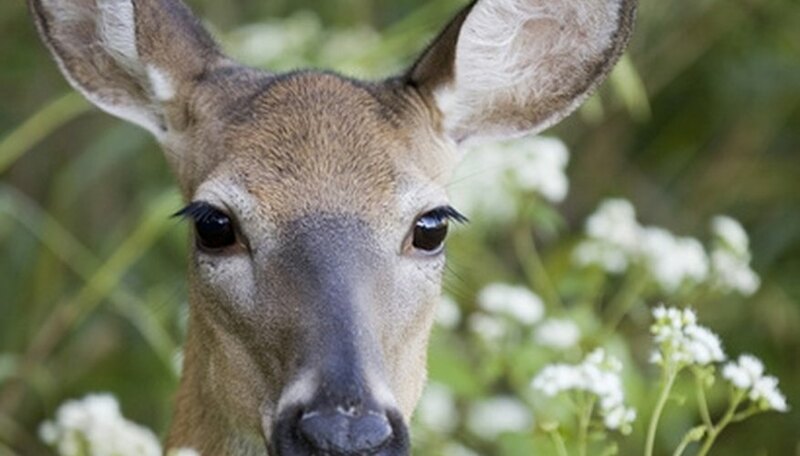 While no plant is considered fully deer-proof, some are much more likely to resist attack. Barberry receives a grade of A from Rutgers, equating this shrub to a "rarely damaged" plant. The remaining grades are B for "seldom severely damaged," C for "occasionally severely damaged," and D for "frequently severely damaged." While planting barberry may protect this single plant in your garden, it does not deter deer from showing up and feeding on other plants, nor does the plant become immune. When selecting other plants for your home garden, look for other highly resistant options and avoid those known for their vulnerability to further decrease the likelihood of damage. Other plants that are "rarely damaged" include, but are not limited to, anise, bayberry, bottlebrush buckeye, common boxwood and lavender. Some frequently severely damaged plants to avoid are American arborvitae, hosta, tulips and wintercreeper, according to the Rutgers New Jersey Agricultural Experiment Station. Take caution when planting barberry in the home garden for deer resistance, as it is considered an invasive plant. First introduced in North America in the 19th century, barberry's wild reproduction threatens native flora. Barberry has "escaped from cultivation" and is taking over areas of native plants by forming large colonies and pushing out native understories, according to the University of Maine Cooperative Extension Publications. The plant is spread even further by birds that feed on barberry berries, transferring the plant to widespread locations. Are Hosta Plants Deer Resistant? Do Deer Eat Holly Bush Berries? Are Physocarpus Opulifolius Deer Resistant?